San Diego Woman Magazine Featured Aall In Limo & Party Bus! 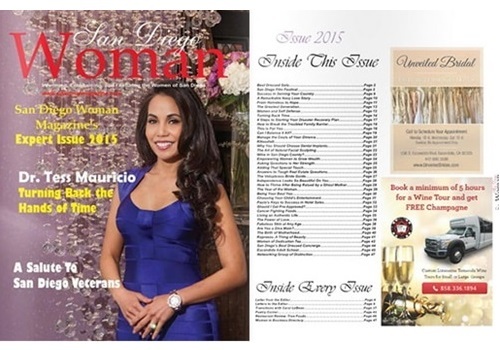 We are proud to be featured in San Diego Woman Magazine's first "Expert Issue" of 2015! Aall In Limo & Party Bus operates with the same West Coast lifestyle in mind and we are happy to be considered a top choice for San Diego ladies who are looking to come together to enjoy fun times at Temecula wineries, bachelorette parties or girls’ night out. We are most thankful for being trusted by the San Diego Woman Magazine and we are looking forward to providing the readers with the very best in San Diego and Temecula limo transportation services. The magazine was started back in 2007 with a simple idea and a ton of enthusiasm. This enthusiasm has led the magazine’s staff for the past 8 years and will continue to do so in the following years. This is another milestone for San Diego Woman Magazine, we are presenting our first ever “Expert Issue”. Over the 8 years we’ve been publishing, we have had some amazing women, and men, who have graced our pages. Professionals, and experts in numerous areas. Everything from Doctors to Roller Derby Queens, from CEOs to creators of products we use every day and don’t even think twice about what life was without these inventions. We decided that we wanted to bring these experts to our reader (in one issue) and asked them to provide a tip or hint of some kind to our readers. The response was overwhelming. We have experts in so many different fields that we know you will come away from reading this issue having learned at least one new thing that your didn’t know. You can find San Diego Woman Magazine at their new website, which is currently a work in progress. Book a Limo for Your next Celebration with Your Girlfriends! Not sure what to do for your next girls' time out? No problem! We can help you plan the perfect day or night, depending on your group size, age, and interests. Our drivers are friendly and laid back and will make sure you and your girlfriends have a blast the entire time! We keep our limos clean and in top condition so you can feel like royalty! To learn more about our San Diego and Temecula limo services, call us at 858-336-1894!